AA Roadwatch have urged motorists to be careful this afternoon. JUST WHEN WE thought we might be in for a dry spell, more rain is sweeping across the country with AA Roadwatch urging motorists to exercise care when driving due to spot flooding. Spot flooding has been reported in Gneeveguilla and Rathmore, as well as Kenmare. There are further reports of surface water on N22 Killarney/ Macroom Road, particularly between Glenflesk and Killarney. Flooding is also reported in Castlegregory. Severe flooding is reported on the N72 Killarney/ Killorglin Road between Fossa and Beaufort Bridge. 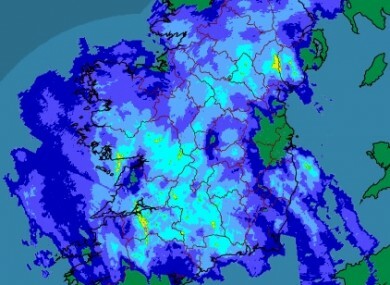 Met Eireann said today is proving to be very wet in many places. They said tonight’s showers will turn heavy and prolonged, especially in Atlantic coastal counties, and there could be a chance of some hail and thunder also. Don’t put the washing out just yet then, you’re saying? How’s it looking where you are – any flooding to report? Email “Not again. More spot flooding warnings issued ”. Feedback on “Not again. More spot flooding warnings issued ”.